These full-range outdoor speakers are an affordable and versatile way bring to sound to your deck, porch or pool. Their excellent build quality and dynamic sound stage remain unmatched at such a price level. Each pair of speakers utilizes a 6.5 inch polypropylene, mica-filled woofer and a 1" pei dome tweeter. The end result is a broader, concise sound stage than most outdoor speakers. The larger drivers are optimized for high rigidity but low mass, giving them a high sensitivity. This equates to modest amplifiers not having much trouble driving them. Their resonant-absorbing mineral filled cabinets are constructed from polymer which prevents sloppy, tuneless bass; often a result from low-cost ported designs. Every pair of outdoor speakers also includes a powder-coated aluminum grille and speaker mount that will not rust or corrode. The micro-mesh design on the provided grille successfully blocks out the elements while not restricting any of the speaker's capabilities. The cabinet is also encased in UV protected paint to always keep your speakers looking their best. With a two-year manufacturer's warranty these speakers are built with longevity in mind and will last for many years to come. 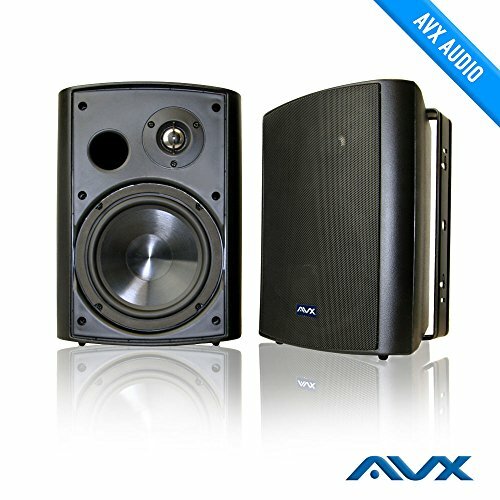 The AVX Audio PSP-B1 features a 6 1/2" injected polypropylene cone with butyl rubber surround features long life and extended deeper bass. 1" PEI dome tweeter is designed for outdoor use and exposure to the elements while resisting corrosion. Secure 5-way binding posts accept bare speaker wire, spade connections, or banana plugs. Accommodates speaker wire up to 12ga. Includes mounting brackets for easy and quick installation. Contact AV Express for any questions regarding installation or tech support. If you have any questions about this product by AVX Audio, contact us by completing and submitting the form below. If you are looking for a specif part number, please include it with your message.